This morning I went to school with no lesson plan and it turned out to be a great day. I taught about American music and how people of different ethnic backgrounds work together. We watched The Blues Brothers. We didn’t watch the entire film, but made sure to show the kids the scene with James Brown in the Baptist church, Ray Charles at the music exchange and the final car chase scene with Jake and Elwood being chased by every Chicago police car. I’ve never seen Thais laugh so hard at something that is actually funny. The majority of humor in The Blues Brothers is not in the dialogue. It is truly a film that transcends language barriers. That was the part I wrote about the day it happened: Thursday, August 16, 2012. Now I’ll tell you what happened in the second part of the day. It involves baseball, sunshine, pouring rain and head-first slides. There was crotch-pot cooking weather when I got to the school in the afternoon. The boys gathered around to play, but didn’t seem too enthused. The first two innings were disgustingly hot and then the clouds rolled in and a strong cool breeze took over. Within minutes there was pouring rain. Thais can’t handle the heat very well, but I have to give them credit in the rain. Only a few kids went home despite the soaking weather. After a full inning, playing an actual game had become impossible as the ball would stop the moment it hit a deep puddle in between the pitcher and hitter. I finally stopped the game for that reason as well as a lot of the boys were out of control, sliding in the mud and slick grass. Then I got an idea. It was time to teach these Thais how to perform a head-first slide and the conditions were perfect. When I began to run, all the kids ran behind me like the workout scene in Rocky II. After I had both teams on my tail, I took a hard left past third base and headed for the softest and slickest grass I could find and dove head first like Pete Rose ending a first-to-third sprint. I repeated this a few times while watching the boys try to do the same. They haven’t worked up enough sprinting speed to slide more than four feet, but they’re working on it. I got home and was reminded of my childhood, coming in the door after playing in the winter, being covered from head to toe in melting snow and having to strip to my underwear before taking a step onto the carpet. 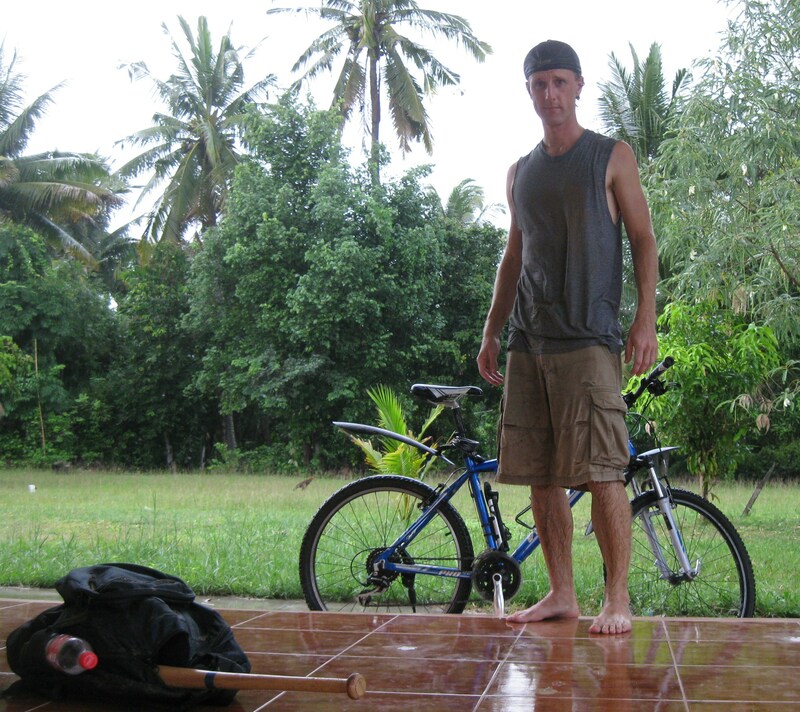 I was soaked and dirty and didn’t want to tread into my house and hung most of my clothes on the covered porch before going in. Thinking of this blog, I snapped a photo before going in. It’s not a game unless you get your uniform dirty. It was probably one of my favorite Peace Corps days. How did it happen? I dropped any internal pressure to teach this and teach that and “make a difference” and just had a good time. This entry was posted in Peace Corps and tagged baseball, blues brothers, movies, peace corps, rocky II, teaching, thailand by Jeff Jackson. Bookmark the permalink.